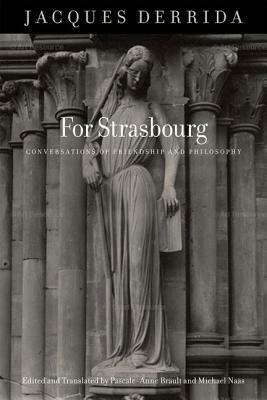 For Strasbourg consists of a series of essays and interviews about the city of Strasbourg and the philosophical friendships Jacques Derrida developed there over a period of some forty years. Written just months before his death, the opening essay, "The Place Name(s): Strasbourg," recounts in detail, and in very moving terms, Derrida's deep attachment to this French city on the border between France and Germany. More than just a personal narrative, however, the essay is a profound interrogation of the relationship between philosophy and place, philosophy and language, and philosophy and friendship. As such, it raises a series of philosophical, political, and ethical questions that might all be placed under the aegis of what Derrida once called "philosophical nationalities and nationalism." The other three texts included in the book are long interviews/conversations between Derrida and his two principal interlocutors in Strasbourg, Jean-Luc Nancy and Philippe Lacoue-Labarthe. These interviews are significant both for the themes they focus on (language, politics, friendship, death, life after death, and so on) and for what they reveal about Derrida's relationships to Nancy and Lacoue-Labarthe. Filled with sharp insights into one anothers' work and peppered with personal anecdotes and humor, the interviews bear witness to the decades-long intellectual friendships of these three important contemporary thinkers. This collection thus stands as a reminder of and testimony to Derrida's unique relationship to Strasbourg and to the two thinkers most closely associated with that city.